Game developer BioWare is releasing an expanded ending sequence for Mass Effect 3 following negative feedback from players. The free downloadable content pack for Xbox 360, PC and PlayStation 3, called "Mass Effect 3: Extended Cut," will be available June 26. The developer says on its website that the update will add additional cinematic sequences and epilogue scenes. It also will "include deeper insight to Commander Shepard's journey based on player choices during the war against the Reapers," BioWare says. In an audio interview on YouTube, BioWare talked about the downloadable content, otherwise known as DLC in gamer parlance, and feedback from players who said the original ending to the three-game series was a letdown. According to PCWorld's Jared Newman, the ending to Mass Effect 3 created one of the most interesting gaming controversies in recent memory, with fans revolting against BioWare because they didn't like the game's outcome. Players flooded the Mass Effect Facebook page with comments about the game's ending. The most notable backlash came in the form of a petition, paired with a charity drive, to "Retake Mass Effect." It raised $80,310 for the charity Child's Play from more than 4000 contributors. 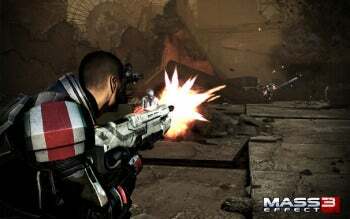 Unlike most other games, the Mass Effect series gives players choices that reverberate throughout the trilogy. Many players complained that their choices didn't matter much when they finished the game, resulting in a disappointing lack of emotional payoff. "I think one aspect is that it's tough to let go of a storyline and characters that you enjoy and the endings didn't really leave a lot of time to say goodbye to the experience. So a lot of people just wanted more closure," said ME3 Executive Producer Casey Hudson in the recording. "In some cases, people feared the worst -- that no matter what your decisions you make, the entire galaxy is destroyed, everyone starves to death and so on, which of course, wasn't our intention. It wasn't the way that we saw it. And it wasn't the intended message about how the Mass Effect universe would end," he said. To see the new content with the extended cut, download it and start with a saved game that's somewhere before the sequence in the end where you attack the Cerberus base. "From there, if you play toward the end then you're going to get the extended cut experience," Hudson said.